Looking for a Formal Notice of breach of Lease contract? Download our Formal Letter Landlord Notice of Termination Lease now if your tenant is not complying with the terms of your lease contract, for example, if he/she doesn't pay the rental fee in time. You can send this formal notice of breach lease to your tenant to give a number of days time before you will have to exercise all legal means available to protect your rights by law. This Formal Notice of breach of Lease contract template covers the most important subjects and will help you to structure and communicate in a professional way. 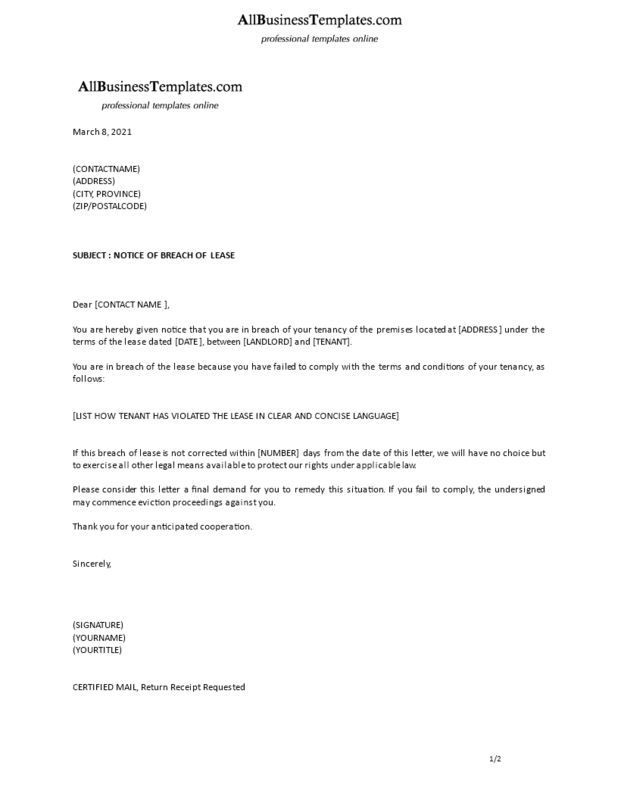 This legal template is crafted and screened by legal professionals. Try out our online Free and Premium Legal templates, forms and contracts today. Using our Formal Notice of breach of Lease contract template or Breach of Contract template guarantees you will save time, costs and efforts: download this breach of lease template, fill-In the blanks, print ...done! Download several templates suitable if you are a landlord and you have issues with your tenant.